As part of the investigation, your truck accident attorney may want photographs of the scene where your accident took place. Your lawyer may have an investigator take these photographs, or may ask you to return to the accident scene to take photographs. If your injury lawyer asks you to take photographs, the guidelines here will help you know what pictures to take. If you are using a digital camera, set the camera to use the maximum image size (number of pixels) and image quality (compression ratio). That way the photograph can be enlarged or projected and still not be fuzzy. If you are using a camera that has a zoom feature, do not use the zoom feature for the views of what the driver could see. After you have taken the checklist photos of what the driver could see, then if you want, you or your truck accident attorney can take extra photos using the zoom feature of your camera. Start traveling on the roadway in the direction that Driver 1 was traveling. Beginning two city blocks away from the car accident area (or if this is on a highway or country road, start a quarter mile away from accident scene). Photograph every traffic control sign that there is all the way to the accident scene. Repeat same type of photos as in the previous item. The only difference is to take this set of two photos from about 100 feet from the impact point. Take a photograph about 25 feet from the point of impact on the roadway (in the direction from which the Driver 1 came). You should take photos of such things as tire marks as well as point of impact debris, if any. 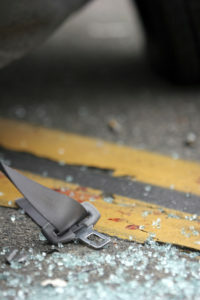 If the road has some track marks or debris left that came from the car accident, photograph each item twice. First, stand looking parallel to the roadway sides. Take a photo end-on the item to show the direction of the debris or marks. Then take a photo side-on to show the length of the marks. Then lay a foot-long ruler or some other item that a juror can identify with on the roadway to show the scale of the item on the roadway. Take another photo with this item in the photo. If there was a witness, take a picture of the scene of the car accident from the witness’ point of view. If you suffered injuries in an auto accident, your truck accident attorney will likely want to have a photographic record of the accident. To learn more about how a lawyer can help you with your case, contact Russell & Lazarus today.